warriors. . Wallpaper and background images in the Warriors (Novel Series) club tagged: jaypaw others. 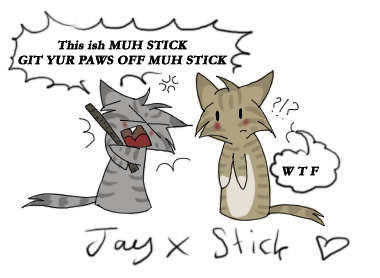 AWW!I like it it is very cute is that Jaypaw Yelling at leafpool to not touch his stick? LOL!!! Jay x the stick of wonder- 4eva!!! yea ur right he does brake the stick... but, THAT'S MA JAYFEATHER!!!! hes ma mate in the book im makin...in my book you can date medicine cats. go to the questions if ya wanna be in it! lol in Omen of the stars #1 he breaks the stick and thats not Leafpool hes talking to its Thornclaw. Oh by the way its very cute+funny very good job!! HI!I'm new 2 THIS CLUB!NOT FANPOP,THIS CLUB!But,hi!my warrior is a kit warrior named Sorrowkit. wut funny?u nevr heard of Miseryclan? WOW! That is extremely funny, i'm laughing my pants of!!! OMG soooo funny and cute!! LOLZ I agree with Jayfeatherfan! lol i luv it! i think it would be better with something like mouse dung instead of wtf. doesnt jayfeather break the stick?? STICK MURDERER!! !